There were solid, if unspectacular gains for US markets last night with the Dow Jones closing up by 0.5%. This morning, European markets have opened slightly higher with the FTSE 100 the standout performer with gains of 0.4% in early trading. Commodities are holding up reasonably well across the spectrum, although oil has dipped by around 0.5% to $71.40. We have a veritable smorgasbord of economic announcements today with a number of European Manufacturing and services reports due. At 08.30 GMT we have the release of the minutes from the last MPC meeting. No real surprises are expected in the voting patterns on rates, but there could be some interesting views on quantitative easing. There should be a similar focus with the FOMC statement at 18.15 this evening. Rates are unanimously expected to remain at near zero, but traders will be keen to learn of any other action the Fed may be taking. The dollar is on the back foot in early trading today with falls of 0.4% against sterling and the euro. The commodity pairs are making a comeback following Monday’s drop in the price of oil. The Aussie is up over 1% against the US and the Canadian is up 0.64%. The yen is having a mixed day with big gains against the dollar, but relatively move against the pound and euro. It’s honours even between the pound, euro and US dollar so far this morning with sterling slightly ahead on balance in early trading. 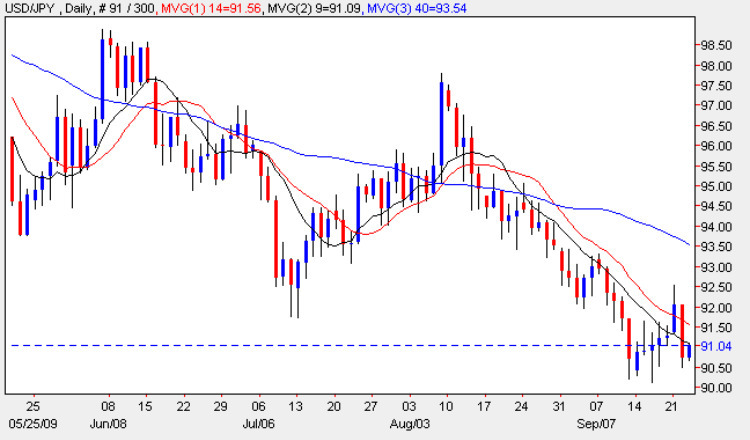 After Monday’s sell off, the yen is once again on the offensive with gains of 0.3% against the euro, pound and dollar. The USD/JPY pair could be where the action is today, especially with today being a Fed day. The down trend still looks to be in force and 90.00 could be a likely target. A One Touch trade with the barrier set at this level over two days could return 142%.